For applications where the MPR E-Scan is to be mounted in a sanitary pipeline, our Sanitary Adapter is the correct choice. Designed and manufactured to appropriate 3-A Sanitary Standards, this adapter is completely polished inside and out with large radii internal corners and tri-clamp fittings. The suggested orientation of the sensing head is on a horizontal plane. A vertical segment of pipe is also acceptable. 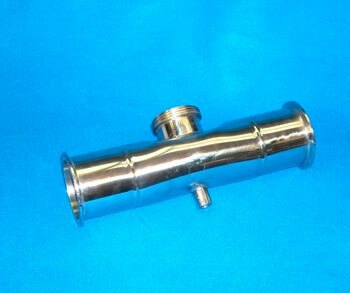 A steam purge tube can be installed for applications that require periodic prism cleaning.